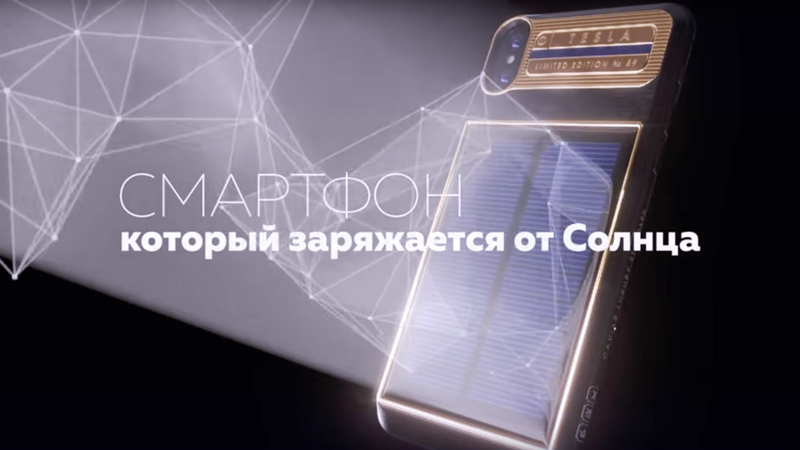 Russian phone accessory maker Caviar has begun sales of a $4,500 “iPhone X Tesla” with an attached solar panel, if for some reason you happened to have thousands of dollars lying around you don’t need, and also feel like leaving your pricey electronics sitting around baking in the sun. The iPhone X Tesla is not really a full edition of the phone, or even really a modified iPhone. Instead, it’s essentially a fancy case complete with carbon fiber, gold accents, and a solar panel that comes paired with an iPhone X boasting 64 gigabytes of memory for the $4,500 edition or $4,829 for a 256-gigabyte edition. (Why the $329 difference when you can pick up the extra memory for just $149 more on a regular iPhone X is unclear, but anyone buying this is already hemorrhaging cash like an armored car hit by a rocket-propelled grenade, so whatever.) It’s considerably bulkier than the original at a thickness of 16.2 millimeter vs 7.7 millimeter, Apple Insider noted, though Caviar claims the case is both shock-resistant and rated to IP67 water and dust resistance. The first unit, which is apparently intended for Tesla CEO Elon Musk, will additionally be engraved with the slogan “Made on Earth by Humans.” Only 999 in total will be made, which still brings Caviar’s total haul if all sell out to around $4.5 million. The phones come with a one-year warranty and free shipping, though the recipient may be responsible for paying sales taxes and duties dependent on the country it’s shipped to. Caviar doesn’t explain exactly what kind of solar panel comes attached to the phone, but buyers beware that the amount of charge one might get from an iPhone-X sized panel may be underwhelming. Ones capable of offering a reasonably fast charge time tend to be much larger than that. The promotional video doesn’t seem to make any claims about the speed at which the case charges either, though one might note that the $4,500 price tag would cover a significant portion of the cost of just installing solar panels on a house. Regardless, given that Musk himself has been rolling in dough by selling overpriced Tesla-branded toys like big crème brûlée torches made up to look like flamethrowers, this is probably a good target market to cash in on.